Women are often blinding boys with our assets, charm, and silky hair; some might say we can persuade boys to do just about anything. Well, one of the latest Tinder trends may just prove this to be true. 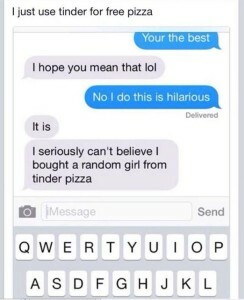 Guys are now picking up girls on Tinder, by buying them pizza! Yes, you heard it right. This blows that cheap Bud Light from the campus bar straight out of the park. Girls are known to get into mischief at slumber parties, with prank calls and gossip but who knew a group of ladies would come up with such a genius plan for free food. 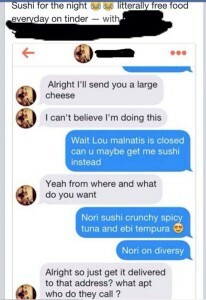 Using the dating app Tinder, girls have been testing the desperateness of men everywhere. 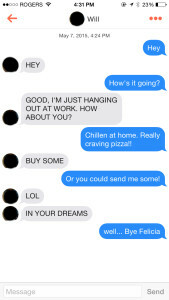 The idea is to message a match and cheekily see if he’ll send over a free pizza. After a few successful trials, the game quickly became a competition to see who could get the most free food ranging from pizza to wings, to even sushi! 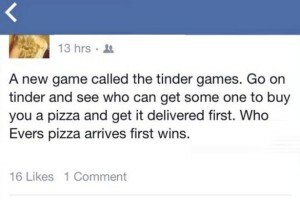 Women have named the act “The Tinder Games,” assumingly after the Hunger Games. As outrageous as it might sound, it appears to be working. So, I asked my male friends whom are active on Tinder, “Is this something you would do?” They said absolutely! Turns out, guys find it hard to break the ice on Tinder and the etiquette of “buying a girl a drink at the bar” can’t happen when online. It keeps the conversation going with the ladies, and proves in some ways, maybe chivalry isn’t dead. Gold star fellas, maybe we’re not the masterminds after all. 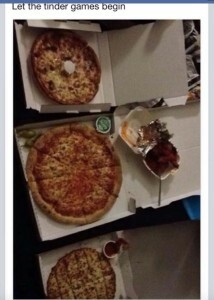 Couldn’t spell “literally” right, too much of a pizza haze I suppose. Sorry pal, that’s $10 you’re never getting back. I even tried it out myself. Clearly my charm wasn’t enough for a competition this fierce. Well ladies, may the odds be ever in your favor! And guys, we hope you can land a date! 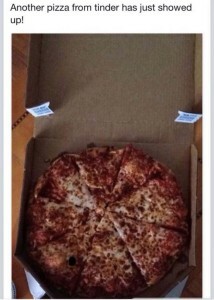 So funny but I think I’d be scared to give a random guy the address I’m at!! Is this any different from what woman having been doing forever? “I just love that Porsche.” “Nothing turns me on like a good steak dinner.” Chicks have been using lines like that forever to get things out of guys they had no intention of ever seeking again after a few rides in the fancy car or the 5-star dinner. 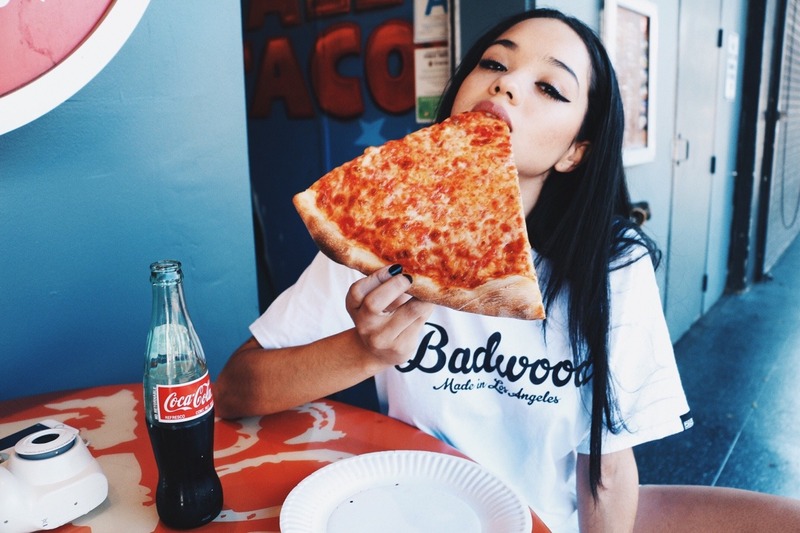 A pizza costs a lot less than a a steak. Hi Candi, thanks for giving my piece a read! Girls have been using these sly moves to get things out of boys for years – quite funny how modern millennials have put their own twist on it! Pizza and steak, yum – now that’s a hard choice!